The UK Government has announced new measures that give the green light for driverless cars to take to UK roads from January 2015. UK cities can now bid for a share of a £10 million competition to host a driverless cars trial and the Government is also calling on cities to join together with businesses and research organisations to put forward proposals to become a test location. 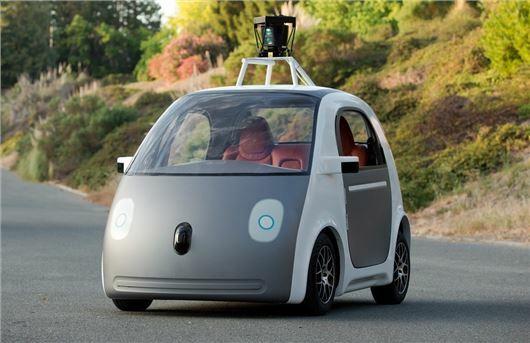 The driverless cars trial will last between 18 and 36 months and will begin in January 2015. Ministers have also launched a review to look at current road regulations. Two areas of driverless technology will be covered in the review: cars with a qualified driver who can take over control of the driverless car and fully autonomous vehicles where there is no driver. Driverless car trials are already underway in the USA, Japan and Sweden and the technology is thought to be at an advanced stage. In California driverless cars are already legal and have clocked up 800,000 miles on public roads. Volvo also begun testing its self-driving cars on public roads in Sweden and it is thought that similar technology is being developed by Ford, Nissan and Volkswagen. Google has confirmed it will build self-driving vehicles too, with a prototype (pictured) currently undergoing testing. The final car will be ready in 2015. Automated cars use a laser scanner along with radar to detect distances, plus orientation sensors and GPS to detect the car's location. These sensors combine to create a full, 360 model of the world around the car. The car’s processor then deciphers the information and makes decisions about acceleration, braking and steering. According to engineers working on the projects, the technology is already used on production cars, with adaptive cruise control, automatic braking and automated parking already found on many UK vehicles. However, the move to go fully automated will take the development to the next level, although there are still many obstacles for the technology, with questions over legal and insurance issues. Ian Crowder, of The AA Insurance, told HonestJohn.co.uk: “Insurance is going to be a big hurdle to overcome and I anticipate that premiums will start off quite high until the technology and risk is fully assessed. “There will also be questions over liability. For example, if the technology fails, will liability lie with the driver or the manufacturer of the car?" As with anything new, this is exciting and nerve wracking too. I look forward to being able to just jump in a vehicle and tell it where to go to and can then relax, (and with all of our modern gadgets, be able to use them on the journey). As the only driver in my family I have to do it all so being able to relax, would be wonderful. But relying totally on the technology to get me and my family from A to B especially from City to City, would take a bit to get used to!!!!!! The question is, who is this marketed at? Would I buy an automated car? No, why? Because I enjoy driving. Automated cars would suit the elderly and disabled. But with start up costs it would be very niche unless the whole country got on board and turned into the streets from i-robot. My final thought, what if you lost GPS coverage, will the car just stop? We take GPS for granted now. But it is controlled by the US government and could be turned off for a number of reasons, including the disruption of terrorist threats. The consequences would be interesting even without driverless cars - the virtual collapse of cellular networks, for a start. What I find difficult to conceive is that driverless cars can in the near term successfully mix with human-controlled ones in anything but a very controlled environment. And it will be easier to control us than to program a car to work with our individual behaviours. Expect a lot more Big Brother oversight and removal of your autonomy. I'm not looking forward to this at all. I think there'll be a long time between autonomous cars arriving and cars losing their steering wheels. Owners will get the choice - they'll be able to drive manually or if they're tired or bored or have a long journey ahead of them they'll be able to get the car to do the work. It doesn't have to be black or white.